On Tuesday, our local branch of the Waldenbooks franchise closed down for good. Undoubtedly, there will be a number of customers that will be coming to the mall in the next six to twelve months asking whoever rents out that spot where the bookstore went, but there you have it. 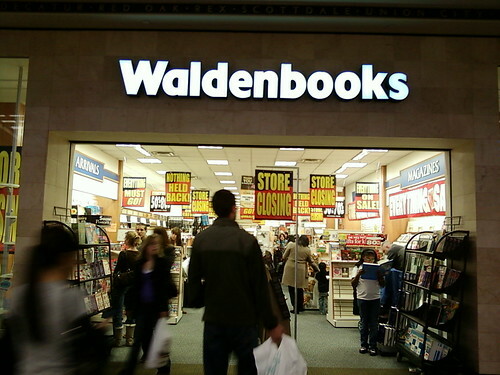 Borders, which owns Waldenbooks, decided late last year that they were going to close down 200 of the smaller mall locations around the country. Two in Vermont - Berlin (My store) and Rutland, were both on the cutting block, although the Borders express in South Burlington will remain open. I'm guessing that this is a bit of a complicated position for Borders - the recent financial crisis added to the already piling issues that brick and mortar face: declining sales in light of competition from online retailers, not to mention absolutely inefficient business practices on the part of how Borders runs their stores, something I've ranted about before. Still, with all my issues about Borders aside, I will miss working there, and the store itself. I began work in the fall of 2006, where I worked at the Kiosk, and continued to work through the winter and next fall as a regular employee, before leaving to work at Norwich University. I returned late last year after a friend left, because I was hit with a bit of nostalgia for the store and working there. While that didn't last long, it was nice while it lasted. I've long been a customer at this particular branch, even before I went to work there. The selection for what I was looking for, mainly science fiction, was always top-notch, and when I began to work there, I met a number of people who I likely wouldn't have met normally, and like camp, I've managed to hold onto a good group of close friends. Looking back at my time there, I've often told myself that if I'm ever going to be in a position to make a television show, I'll write something about here. There was endless problems with customers, other employees (there was always drama of some sort) and from all that, quite a lot of humor and laughter. Romance books were something that could easily be thrown across the store at an annoying co-worker, but also the slow times, after all of our duties were done, chatting with people for a couple hours in-between customers. There are a lot of good memories there, which I'll remember over the bad times that I've had there (and there were several). Hell, I'll even miss some of our crazy regular customers who were really out there. Plus, the bookstore was a source of a lot of books for me. We made sure (when we could) that the comics and Science Fiction and Fantasy section was well stocked, special ordering books that we knew would move out the door, kept it well stocked and neat, and offered a good selection of other books as well. There's a bunch of stores in the area, such as Bear Pond Books, Rivendell Books and the Northfield Bookstore, but they just don't have the same selection. I'll stop in when I can, but I just won't make a point to stop by and browse, because my friends won't be there either, as I'd often do over the past couple of years. So, farewell, bookstore. I'll miss giving you money in exchange for feeding my habit of books, and while my wallet and bookshelves won't thank you, I'll miss the fun times that never will be, and the friends that I made there.